Article written by George Stefano Pallas. Jonathan Hurley in Seoul contributed to this report. Views and bad writing expressed by the author are his alone and do not necessarily reflect nor should be construed as those of the Author. 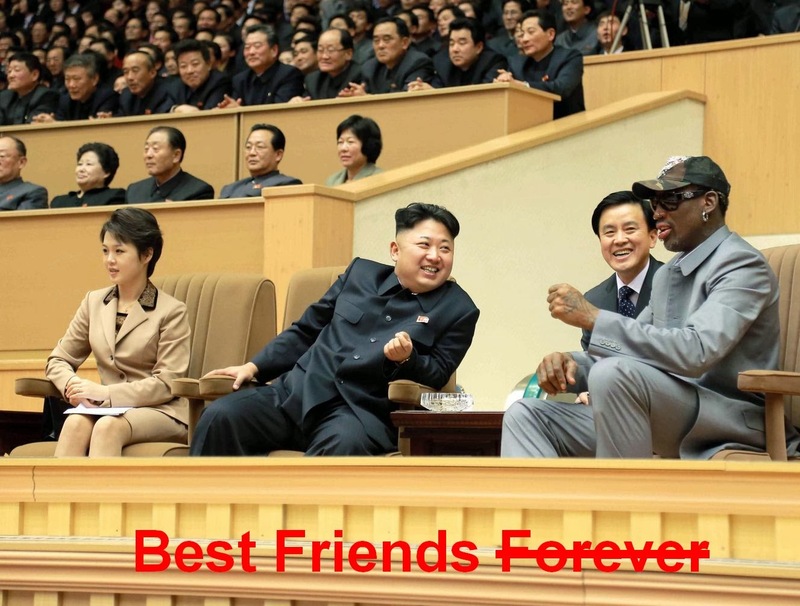 In the aftermath of GQ magazine’s most influential Least Influential list of 2013, many Americans wondered what could possibly wound Dennis Rodman’s pride more than being dubbed a “Q-list celebrity willing to commit borderline treason just to hang out with a dictator who himself aspires to be a Q-list celebrity”. Apparently, being declared an ex-Q-list celebrity. As in expired, extinguished, and exterminated. Dead. Rodman’s own companions had emphatically warned him against making such an inappropriate and unpatriotic display in front of a sworn enemy of the United States who routinely threatens to nuke them and their allies in the South. One of the retired American players to participate in the game, Charles D. Smith, disclosed to the Associated Press that, “We always tell Dennis that he can’t sing. He is tone deaf. He did it alone.” These remarks were obtained from within a concentration camp where Smith and his eleven teammates are being held indefinitely as accomplices in Rodman’s spontaneous transgression. The Author’s Files would print gruesome photos taken at the scene of the stadium, but one witness of the horrific act testified that “the corpse was so riddled by machine-gun fire that it was hard to identify afterward” and Rodman’s remains were reportedly stuffed in a body bag and dumped into the ocean shortly following his demise. Scholars have argued that this burial at sea is consistent with Korean funeral rites, but conspiracy theorists like Alex Jones have asserted that, to the contrary, the official Atheist doctrine of the DPRK gives no guidelines as to the proper treatment of the deceased. Rodman may not be among the year’s healthiest celebrities any more, but on the bright side he can no longer be accounted among the least influential. The KCNA has said that Kim Jong-un is seriously considering his old friend’s proposal to engage the world through the universal spirit of competitive sports. Unfortunately, according to United Nations investigations, 84% of his team’s members are too skinny and malnourished to meet the basic Olympic qualifications for the sport. Multiple western news sources have attempted to reach Kim Jong-un for an interview on his relationship with the late Rodman, but the leader is supposedly busy overseeing the construction of a water park inside his palace at Pyongyang. Testing of the park’s attractions was opened last week to professional mechanics of the Workers’ Party. If only Dennis Rodman were alive to see the fruits of his labor. Anderson Cooper would tell you he’s undergone a 360 revolution, but it’s really closer to 180 degrees. Originally regarded as one of the classier hosts on CNN, Cooper has been the subject of many an embarrassing headline in recent days, from his unwanted (gay) coming-out to his X-rated moves on live, Newyear’s broadcasts with Kathy Griffin, but all of his past mishaps dissipate next to his latest offense. The would-be-rebel was arrested last night in D.C. for defiling public property in an experiment to determine how human waste reacts to extreme temperature lows. Cooper had wondered aloud on his Wednesday show whether a video purporting to show a man’s urine vaporizing instantly in frigid, polar-vortex weather was real or fraudulent. As it turns out, the journalist was right in his suspicion that the video was forged, and the results of his research are consequently written all over the China-imported Martin Luther King Jr. memorial. Dude, Jimmy Kimmel totally beat you to this joke. But I laughed all the same, so thanks anyway. I don't care what Kimmel said about the passing of Dennis Rodman – the death of a human being is never a laughing matter, no matter how ironic the circumstances or unlikeable the individual. I was certainly never a fan of Rodman, but no fault of his own would ever compel me to stoop to mockery or cynicism in his family's time of grieving. George Pallas had no intention whatsoever to deride Rodman or make light of his loss; he was strictly reporting the objective facts of case according to what we know from international watchdogs and the KCNA.